I wish I could go back in time and burn any croquis I ever developed, drew or copied. I wish I hadn’t been afraid of what was going to come from my hand, my brain. I wish that I didn’t create a crutch for myself. I wish I never used a croquis. Croquis is french for “sketch.” The term “croquis figure” is used in fashion design schools to describe a figure on which you draw designs or quick “croquis” sketches. 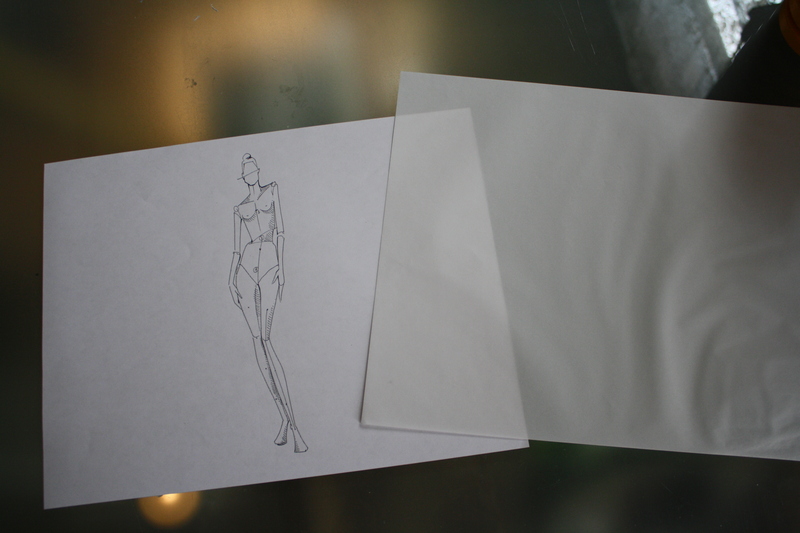 You take the figure, lay your paper on top of it and draw your designs. Bam. Very quickly, fashion croquis are 9 heads high (go on and count them), and have exaggerated proportions: long legs, arms and a short waist. Faces, hands and feet are generally negligibly drawn. We go for drama, movement, and dreams in these figures. This is what is generally called a croquis. All nine heads of her. From Nancy Riegelman’s book. This is what I immediately ran to before I picked up my pen. I couldn’t design without it. It’s like when an actor doesn’t learn their lines and never goes “off book.” It’s like using Cliffs Notes. In true fashion metaphor, it’s like a girdle. There’s a war story I heard when I was studying dance, that an instructor used tell about a dancer rehearsing for a show. Every time the dancer would get to the part in the combination where he had to do a triple pirouette, he would stop, stand there and just twirl his finger as if to say, “This is where I do the pirouette.” He did this so regularly that by performance time, that’s exactly what he did as well. Now that I teach design, I completely understand how it happens. The design process isn’t a straight line, one clear step in front of the other. Sometimes drawing doesn’t come as easy but you have to put your ideas down so you use the figure. Then you use the figure to do final drawings and portfolios. And then you can never NOT use it. These days there are books that have all different croquis posed in innumerable ways and for different markets: womenswear, swimwear, maternity, kids, menswear. When I used to interview students for intern positions, I would recognize the croquis figures in their portfolios. I knew what book they got it from and who the author of the book was. I know because I labored over the exact same drawings in the exact same books, wanting to draw like them and wondering how they did it. There are two excellent fashion drawing books that I recommend – that I think encourage students to develop their own technique: Nine Heads by Nancy Riegelman and Fashion Sketchbook by Bina Abling. It’s a vast topic (that I’m certainly not an expert in) but they cover a lot of ground and my copies are well worn. I’m taking a hard stand and I’m not going to use a croquis again. I’m sorry but you’ll have to see some of these drawings. Wish me luck. I spent a few hours at the Fashion Incubator with my friend, the talented designer, Autumn Kietponglert of Heartless Revival. I hadn’t seen her work in several months but she was gearing up for a bunch of events for Fashion Week (let’s just call it Fashion Month) and needed a little help so I said I would do what I could for her. She has so many amazing ideas and I’m so heartened to see her streamlining her designs and saving herself some time and money. She’s making these gorgeous scarves with great texture and an ingenious way of putting it together. How to make them better/easier/quicker? She told me it takes something crazy, like 400 hours to do them. Makes me want some pasta. 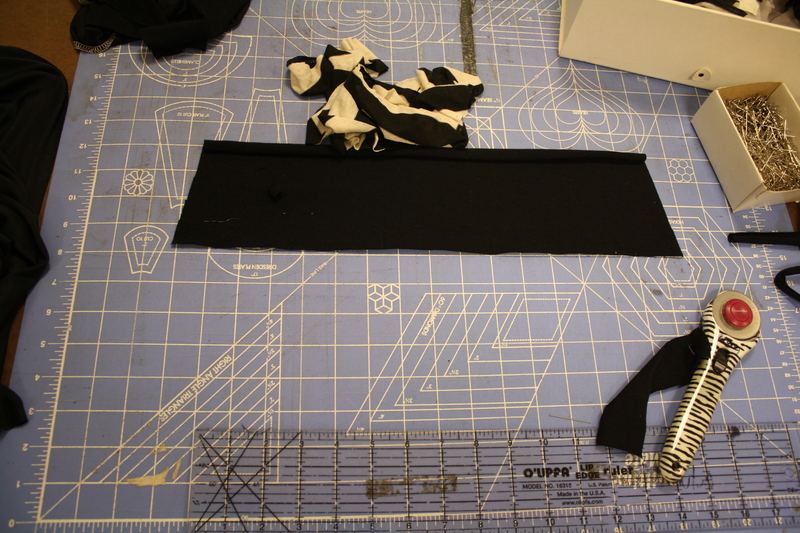 All the strips are cut individually and slowly. I tend to be on the side of making things as quickly as possible (which has it’s own drawbacks) but my first instinct was to double or even quadruple the fabric when it gets cut. 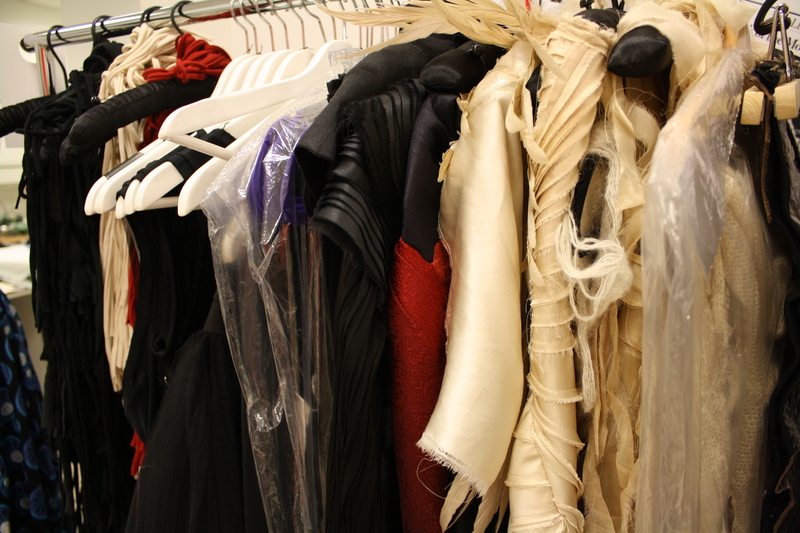 In production, so much time is spent just preparing the fabric to do what you want to do with it. One of those steps is spreading the fabric which, in this case, is a jersey knit and probably one of the more tedious fabrics to spread. It likes to flop around and stick together and you can find yourself walking around the table quite a bit to get it spread nicely. Also, if bigger, longer pieces were used, there would be less time spent spreading. But then you need more space to do it and I’m sure your cutting blades go dull faster so it may be wash at that point. I have a headache now. You can’t live without your sample hands. I adjusted a bodice pattern I made for her four years ago to create a new knit dress. I was happy to learn that she’s used it constantly since then to create more patterns so that’s money well spent. I also whipped together a knit jacket with some textural beading and exaggerated shoulders. Autumn is venturing more and more into knits so it’s requiring a retooling of patterns and expertise with machines and handling. 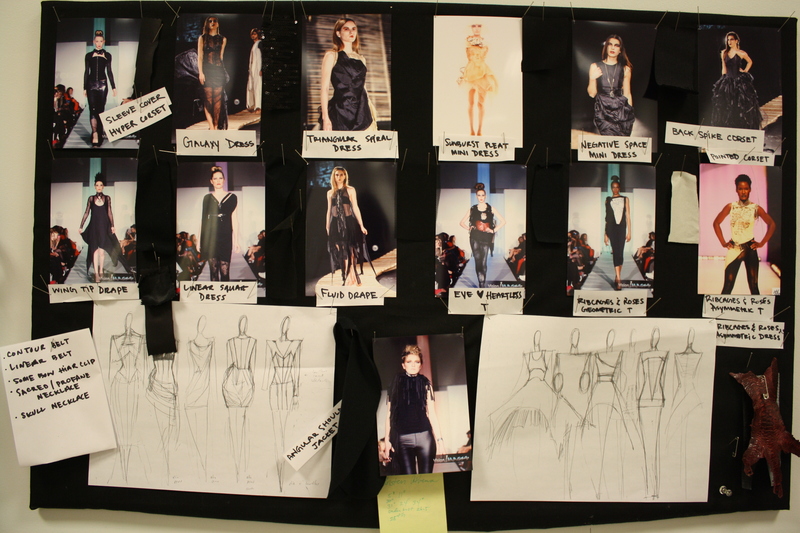 However, fittings are a breeze and the garments are much more wearable. We took a look at some of her fantastical garments and I had the thought that she needed a simple slip sloper developed so she can use it as a base on which to design her amazing, dreamy dresses. So I’ll be draping and getting that to her in a few days and hopefully it will come in just as useful as the first pattern I made for her. Autumn is very skilled at letting her dreams guide her. Her designs are directly inspired from an inner life, another ethereal world that has been an endless reservoir from which to draw. 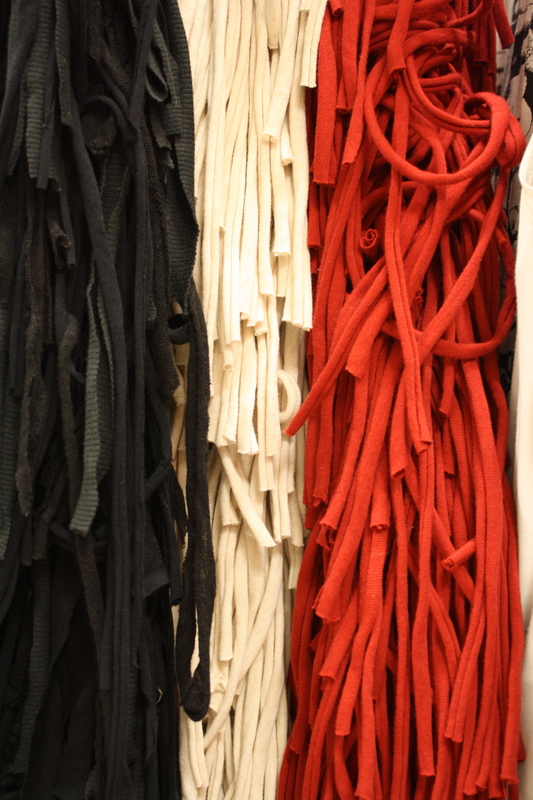 It’s quite a challenge to synthesize them into the contraints of pattern making, time, money etc. But that’s what design is about.